The title of this post is the same as that of this article on the Sunderland Echo. These are the first two paragraphs. She added: “Residents of Washington often feel like the town is an island compared with neighbouring cities and towns. It contains 70,000 of my constituents, 70% of whom use their car to get to work. The Minister thanked the MP for her comments and said they would be taken into consideration. Washington station was on the Leamside Line. There have been plans for over ten years to reopen this line to passenger trains linked to the Tyne and Wear Metro. Under Proposed Extensions And Suggested Improvements in the Wikipedia entry for the Tyne and Wear Metro this is said. Washington, either via the disused Leamside line or a new route. Present planning may lead to the Leamside line being opened at least as far as Washington as a conventional rail line for passengers as well as freight, although this could be shared with Metro trains in the same way as the line from Pelaw Junction to Sunderland. In 2009 ATOC suggested reopening the Leamside line as far south as Washington. On 12 July 2010 local MP Sharon Hodgson started an online petition on the website of local radio station Sun FM to get the Metro extended to Washington. It is also intriguing to look at the specification for the new trains, where this is said. During supplier engagement events in 2018, Nexus have now removed the provision for dual voltage operation from the specification, with preference for passive provision for future battery storage technology. Battery technology is an interesting possibility for an extension of the Tyne and Wear Metro to Washington, as it’s only a few miles. The junction between the Leamside Line and the Tyne and Wear Metro would be easier to build, if trains only went North to Newcastle. Heavy rail could be used to Washington, but on balance it would probably be easier to use the Metro, as where would heavy rail trains turn? There is also a good suggestion to develop a South Shields to Sunderland service. This would balance services to Sunderland, if some Sunderland services were switched to Washington. There certainly seems to be a lot of support for reopening railways in the North East! In New Merseyrail Fleet A Platform For Future Innovations, I quoted from this article on the Rail Technology Magazine web site. The article mainly is an interview with David Powell, who is programme director of rolling stock at Merseytravel. This is a direct quote from the article. We will be exploring, with Stadler, what the options are for having the trains becoming self-powered. This isn’t the bi-modes that lots of other people are talking about in the industry; this is on-board electrical storage. The Wikipedia entry for Merseyrail links to this document, which puts a lot more flesh on Merseyrail’s intentions for battery trains. It outlines strategies for the following routes. There is a reasonable business case for extending the Merseyrail service through to Helsby. services. This will be tested on the new units in 2020. According to Wikipedia, the sixth Class 777 train to be delivered will be fitted with batteries. Currently, the service between Liverpool Central and Ellesmere Port stations is as follows. A train every thirty minutes. Trains take eighty-five minutes to do the round trip from Ellesmere Port round the Wirral Loop under Liverpool and back to Ellesmere Port. There are thirty-one stops on the route. There is a five minute turnround at Ellesmere Port station. Two trains are needed to run the service. The Current Class 507/508 trains and the future Class 777 trains both have the same operating speed, but there are performance differences. The British Rail trains have 656 kW of power per train, whereas every new Stadler train will have 2,100 kW. The speed may be the same, but the acceleration will be much greater if needed and and the regenerative braking should be powerful and smoothly controlled. Loading and unloading of passengers with their increasing levels of extras will be much faster due to the hollistic design of the trains and the platforms. It would not be unrealistic to see around a minute saved at every stop. The extended service between Ellesmere Port and Helsby stations is not much extra distance and time. Just over five miles each way. About thirteen minutes each way , based on existing services on the route. So if the terminus were to be moved to Helsby, when the new trains are in service, the time savings between Ellesmere Port and Liverpool should cover the extra distance. It should also be noted about Helsby station. It has four platforms and could probably handle four trains per hour (tph). A platform with a charging station could be created. It has a wide selection of services including Chester, Llandudno, Manchester and Warrington. To my mind, Liverpool to Helsby would be an ideal route for a battery electric train. reviewed after the Merseyrail units have been tested for battery operation in 2020. Currently, the service between Ormskirk and Preston stations is as follows. Trains take around thirty minutes to go between the two terminal stations. The route is fifteen and a half miles long. There are three stops on the route. There is a long turnround in a bay platform at Preston station. At the present time, the service seems rather erratic, with some services replaced by buses and long connection times at Ormskirk. The service between Liverpool Central and Ormskirk stations takes thirty-five minutes with eleven stops and is generally every fifteen minutes, with a half-hourly service in the evening and at weekends. If a Class 777 train could use battery power, I estimate it could run between Liverpool Central and Preston stations within an hour. This would surely open up the possibility of a new service between Liverpool and Preston. It would take only a few minutes longer than the fifty-one minutes of a direct train between Liverpool Lime Street and Preston stations. It would connect a lot of stations to West Coast Main Line at Preston. It would link the major sporting venues of Aintree, Anfield and Goodison or Everton’s new ground to the North. At the Southern end, it could connect to Liverpool Airport. The Class 777 trains would need to be able to do about thirty miles on battery power and if required, the technology exists to either top up the batteries at Preston or use a pantograph to access the overhead wires of the West Coast Main Line. At the present time, the Ormskirk Branch Line between Ormskirk and Preston stations is only single track and probably needs resignalling, but I suspect that a four tph service could be run between Liverpool and Ormskirk, with two tph extended to Preston. Extra track work, North of Ormskirk and the reinstatement of the Burscough curves would allow. Four tph between Liverpool and Preston via Ormskirk. A service between Liverpool and Southport via Ormskirk. A service between Preston and Southport. There is even the possibility of extending Liverpool and Preston services to Blackpool South station, if they used the overhead electrification through Preston to charge the batteries. workforce to access the site via public transport. The Borderlands Line provides a service between Liverpool and Wrexham Central station with a change at Bidston station. The twenty-seven miles between Wrexham Central and Bidston are not electrified. The line is double-track throughout. There are twelve stations on the line. The service is hourly, but probably needs to be at least half-hourly. The service takes about an hour between Wrexham and Bidston stations. Using Class 777 trains on the route, using battery power between Bidston and Wrexham Central stations would enable. A direct service, that terminated in the Wirral Loop under Liverpool. An increased capacity at Bidston station. I estimate that a time of perhaps seventy to eighty minutes between Liverpool Central and Wrexham Central stations will be possible. There would be very little infrastructure work, except for new stations and the possible ability to top up batteries at Wrexham Central. I suspect that political problems, rather than any railway ones will be larger. and what the realistic potential for operating passenger services over the line is. The Bootle Branch is known as the Canada Dock Branch in Wikipedia. Class 777 trains with a battery capability and the ability to use the overhead electrification into Liverpool Lime Street would be able to serve this route, without the need for electrification. Obviously, if for freight efficiency, the route was electrified, the trains could use it as needed. identified a poor business case. I can’t identify the actual route, but there are various rail alignments into and through the Docks. network further through to Wigan will need to be developed separately. I wrote about this plan in Merseyrail To Skelmersdale – How To Plan A New Rail-Link. It is a comprehensive expansion strategy, where much of the work to create the various extensions is performed by adding equipment to the trains in factories or depots, rather than by the disruptive installation of electrification. It looks very much like a case of Have Swiss Train Will Travel. But then, I think the London Overground is using a similar strategy to expand in partnership with Bombardier. Other networks like the Tyne & Wear Metro and those in cities like Birmingham, Cardiff, Glasgow and Leeds will be using similar philosophies. Cardiff has already decided and Stadler are building the trains for the South Wales Metro. The title of this post, is the same as that of this article on Rail Magazine. Reading the article, it appears that the contract will be awarded, by the end of 2019. After writing Comparing Stadler Citylink Metro Vehicles With Tyne And Wear Metro’s Class 994 Trains, I think it is highly likely that Stadler will be in pole position, with a member of the Citylink family. As the Class 994 trains of the Tyne and Wear Metro, are being replaced, it will be interesting to compare them with the proposed Stadler Citylink Metro Vehicles for the South Wales Metro. Under Proposed New Fleet in the Wikipedia entry for Tyne and Wear Metro Rolling Stock this is said. In November 2017, the Chancellor Philip Hammond announced that the government would provide £337 million towards the new fleet. The proposed new fleet would consist of 84 trains to replace the existing 90 train fleet, as Nexus believe that the improved reliability of the newer trains would allow them to operate the same service levels with fewer trains. These are proposed to have longitudinal seating instead of the 2+2 bench seating arrangement of the present fleet, and a full width drivers cab instead of the small driving booth of the existing trains. The proposed new fleet is planned to have dual voltage capability, able to operate on the Metro’s existing 1.5 kV DC electrification system and also the 25 kV AC used on the national rail network, to allow greater flexibility. Battery technology is also being considered. A dual-voltage capability will be required. Battery capability would be ideal for short movements and regenerative braking. In my, view longitudinal seating needs a walk-though capability. Currently, trains are two-car units and generally work in pairs. Trains can work in formations of three and four units, but the ability is not used. If trains generally work in pairs would it be more affordable to have four-car trains? In the following I will assume that the Stadler Citylink Metro Vehicles are similar to Class 399 tram-trains, as they are both members of the Stadler Citylink family. The width and height of the two vehicles are as follow. There’s not much difference here. Class 994 train – 55.6 metres and two sections. Class 399 tram-train – 37.2 metres and three sections. South Wales Metro’s Metro Vehicle – 40 metres (?) and three sections. It should be noted that Citylink tram-trains in Valencia have four and five sections. Having used the Class 378 trains, with their walk-through capability and longitudinal seating, on the London Overground for at least seven years, I believe there is no other way to design a high-capacity metro train. So the Tyne and Wear Metro’s new trains could be 110 metres long and four walk-through sections. This train would be the same length as two current trains working as a pair, which they generally do! The design reduces the number of cabs. Passengers distribute themselves along the train better. Passengers can move to the convenient point to disembark at their destination. On train staff are more prominent. If in the future, the trains need more capacity, extra cars can be added. Class 994 train – 64 seats and 188 standing. Class 994 train – 9 passengers per metre. Class 399 tram-train – 6.4 passengers per metre. South Wales Metro’s Metro Vehicle – 6.4 passengers per metre. Are we creating trains, that give passengers more space? The Class 994 trains have two double-doors on each side of all cars. But with Stadler Citylink vehicles, it appears the number is flexible. Sheffield’s three-car Class 399 tram-trains have four double-doors on each side of the train. Visualisations of the proposed Stadler Citylink Metro Vehicles, show a double-door in each of three cars. Karlsruhe’s version only appear to have a double-door on the two end cars on one side only. It would appear that the customer gets what they want. There is no speed given for South Wales Metro’s Stadler Citylink Metro Vehicles, but they are replacing diesel trains with a 120 kph maximum speed. As tram-trains share tracks with faster trains, I would expect that a maximum speed of at least 100 kph is needed. South Wales Metro’s Stadler Citylink Metro Vehicle – 25 KVAC and battery. I also suspect thst the Class 399 tram-train and other members of the Citylink family, can run for a few metres on battery power in order to bridge the gap between different voltages. It is worth noting that future vehicles for the Tyne and Wear Metro will need to access both 1500 VDC and 25 KVAC. A possible battery capability is also mentioned. I suspect that Stadler could easily produce a Citylink to work on all these common European voltages. All except 3000 VDC are already in service in Gerrmany, Spain or the UK. So the Tyne and Wear Metro’s unusual 1500 VDC shouldn’t be a problem. Wikipedia says this about the minimum curve radius for a Class 994 train. The vehicles have a minimum curve radius of 50 m (55 yd), although there are no curves this tight except for the non-passenger chord between Manors and West Jesmond. This page on Wikipedia, says that the Karlsruhe Citylink tram-trains can handle a minimum cure radius of twenty-two metres. I am led to the conclusion, that a version of the Stadler Citylink Metro Vehicle similar to those of the South Waes Metro, could be developed for the Tyne and Wear Metro. Length of two current Class 994 trains, which would be around 111 metres. Walk through design with longitudinal seating. Level access between platform and train at all stations. A well-designed cab with large windows at each end. Ability to use overhead electrification at any voltage between 750 and 1500 VDC. Ability to use overhead electrification at 25 KVAC. Pantographs would handle all voltages. A second pantograph might be provided for reasons of reliable operation. Ability to use onboard battery power. Regenerative braking would use the batteries on the vehicle. Many of these features are already in service in Germany, Spain or Sheffield. The train would be designed, so that no unnecessary platform lengthening is required. As in Cardiff, the specification would allow street-running in the future. Could battery range be sufficient to allow new routes to be developed without electrification? I also feel that the specification should allow the new trains to work on the current network, whilst the current trains are still running. The first impression given by a station when you arrive in a town or city is important. Some like Cambridge, Kings Cross, Liverpool, London Bridge and Reading say you are arriving in a place that is important, but others fail to get over a positive message. If you compare Sunderland station to those at Middlesbrough and Newcastle, it doesn’t score well. This set of pictures shows the important Sunderland station, which serves a city of nearly 200,000 people. Passenger facilities are limited for a city, that is the size of Sunderland. The lighting levels are not as high as the other Tyne and Wear Metro stations, that are in tunnels. A coffee kiosk on the double platform would be welcome. I get the impression that the station was designed down to a cost, rather than up to a passenger standard. The Metro currently runs five trains per hour (tph) between NewcastleAirport and South Hylton stations. I suspect that the number of trains will increase when new trains run on this branch. The Metro has put forward proposals to run services on the Durham Coast Line to Seaham station. Four tph? Northern will also be doubling the frequency of their hourly service between Middlesbrough and Newcastle. These improvements could raise the train frequency from six to perhaps twelve tph. Through trains will not be a problem, as with modern signalling and trains, the frequency of trains in both directions could be as high as the twenty tph, that will be running on the East London Line in a couple of years. But would it be possible to turn Grand Central and Virgin services that terminate at Sunderland in the time available between Metro trains. The twelve minutes available at present with five Metro tph is obviously enough, but what if the Metro frequency were to be substantially increased? As both Grand Central and Virgin would probably like to increase their frequencies to London, a solution will need to be found. 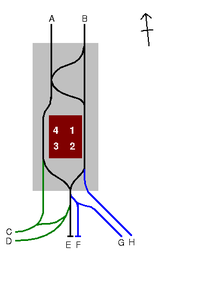 This diagram from Wikipedia, shows the track layout at Sunderland station. I think an engineer named Baldrick has been at work and they’ve devised a cunning plan. If you arrive from the South on the 16:38 Grand Central train, it appears that it returns at 17:31. So does it use time profitably, by sitting in the non-electrified siding labelled F, where it is refuelled and restocked, whilst the crew get a well-needed rest? Let us suppose the frequency through Sunderland is twelve tph or a train every five minutes. A train from London arrives in Platform 4 and would have five minutes to reverse into the siding. When it leaves for London, it would a five minute window to move into Platform 1, pick up passengers and proceed South. The current service is five trains per day. It certainly looks possible, but as there are two sidings and twelve five minute slots in an hour, I suspect that theoretically at least four tph could be turned back South if required. Note that if the trains had a degree of automation, this would make a higher frequency attaining a higher frequency a lot easier. , I also suspect the capacity of the East Coast Main Line restricts services to Sunderland, more than the actual capacity at Sunderland station. The track layout at Sunderland station seems to have been designed to handle many more through trains than it does now! In addition, it has a large capacity to turn trains from the South. Obviously, modern trains and signalling is required. Sunderland station may appear to be rather ordinary, but the track layout can cope with a lot of trains. The Tyne and Wear Metro is unique in the UK, in that it is a regional electric railway system, that is powered by 1500 VDC overhead electrification. But what is not unique about the system is the affection shown by regular users. You get similar feelings on other local systems like these. As they mature, other systems including the Manchester Metrolink, Midland Metro and the London Overground will be felt of by their passengers in a similar way. My four examples and the Tyne and Wear Metro, have a lot more in common than just affection from their users. All were created in their own unique ways in an era not noted for railway innovation. Merseyrail has an unrivalled tunnel layout for a railway under a city. The Docklands Light Railway is automated with a Train Captain on each train. Glasgow’s Blue Trains were very-un-British at the time. Local interests were very much involved in creating the systems. The Tyne and Wear Metro was created for Driver Only Operation. All of these lines are seeking to add more branches and replace, update and augment the rolling stock, much of which is forty years old. Does the age of te trains show Central Government contempt for important local railway systems, which are the lifeblood of communities? The tunnels under Liverpool and Newcastle, were part of a three pronged plan by to improve local transport in the North. I remember from the 1960s, when I was at the University, the electric railway under the Mersey to Birkenhead and the Wirral. Modern it was not, but the innovative Loop and Link Project made it a lot better. Although, that project was never completed. Newcastle had had Tyneside Electrics from the 1900s. In the 1970s the old system became the core of the Metro, with the addition of a central tunnel. The third plan was to bore the Picc-Vic tunnel under Manchester to link Manchester Piccadilly and Victoria stations. According to Wikipedia, it would have had the following characteristics. Low-level stations at Piccadilly and Victoria. Trains would have been similar to the Class 315 trains, which are still common in London. It would have joined the suburban rail services together across the city. How would Manchester have developed if this important tunnel had been built? We will probably be able to partially answer this question, when the Ordsall Chord is fully operational, which will handle cross-Manchester long-distance and local trains. It is my view that cancelling this tunnel was one of the great infrastructure mistakes of the period along with the cancellation of the Channel Tunnel and London’s Third Airport at Maplin. But then Harold Wilson believed everybody would have their own car and that railways were of the past and preferred to spend what little money the Government had on political projects, many of which were total failures. We must protect ourselves from politicians, who have a political view that owes too much to the extreme left or right and be left to get on with our personal lives. To my mind, it is no surprise that the cities in the UK with the best urban rail systems; London, Cardiff, Liverpool and Newcastle, have more local control. Now that Birmingham, Glasgow, Leeds and Manchester have greater local control, will we see improvement? There are several main assets and factors that make up a railway system. I shall now give my thoughts on these in detail. The branches of the Metro were all built for heavy rail trains and the Sunderland Branch even shares the tracks with Class 142, Class 180 and heavy freight trains. This principle of building tracks for full-size trains, has been used on Merseyrail’s Northern and WirralLines, London’s Trameslink, Crossrail and East London Line and innumerable railways across the world. Build a system for small-size trains and you paint yourself into a dead end. I doubt for instance, London will ever build another new Tube-size line across London. As I explored the Matro, the tracks also seemed to be in generally good condition. This picture taken at South Hylton station shows typical track in apparently good condition. Wikipedia has a section on the tunnels of the Metro. This is said. The tunnels were constructed in the late 1970s, using mining techniques, and were constructed as single-track tubes with a diameter of 4.75 metres. The tunnels under Newcastle were mechanically bored through boulder clay and lined with cast iron or concrete segments. The tunnel under Gateshead, was bored through sandstone and excavated coal seams. Old coal mine workings, some of which dated from the Middle Ages had to be filled in before the tunnelling began. This description of the Crossrail tunnels is on this page of their web site. The Crossrail tunnels have a walkway on either side, but they are only 1.25 metres larger in diameter than those of the Metro. So it would appear that there is not much difference in size of the important section in the middle, where the trains run. It is worthwhile looking at the widths of various trains. The last three figures are from Wikipedia. Look at these pictures of some of the tunnels and bridges on the Metro. The weather could have been betterfor photography. I rode on all the branches of the Metro and, I get the impression that all the bridges and tunnels seem to have been built with a generous clearance in both width and height. I very much feel that when the Metro was built that unlike some other lines, it was well-built to a heavy rail standard. I wouldn’t be surprised to be told, that a battery-powered train based on say an Electrostar like the Class 379 BEMU demonstrator, could pass through all of the Metro. The electrification is a unique 1500 VDC overhead system, which is the same as was used on the Woodhead Line, which closed to passenger trains in 1970 and to goods in 1981. Could it be that the Metro got this voltage, rather than the 25 KVAC used on similar systems in London and Glasgow suburban routes, as British Rail and their contractors had 1500 VDC expertise available in the North and all their 25 KVAC expertise was employed elsewhere? The bridges and tunnels seem to have been built with the ability to handle the higher and more common voltage. 1500 VDC may have also saved on the cost of the installation, as they had a lot of gantries and brackets from the Woodhead Line. These pictures show the simplistic nature of some of the electrification. However, on the South Hylton Branch, which was built in the 2000s, it appears that better methods were used, as these pictures show. The gantries and supports are certainly better than many you see on the Lea Valley Lines. 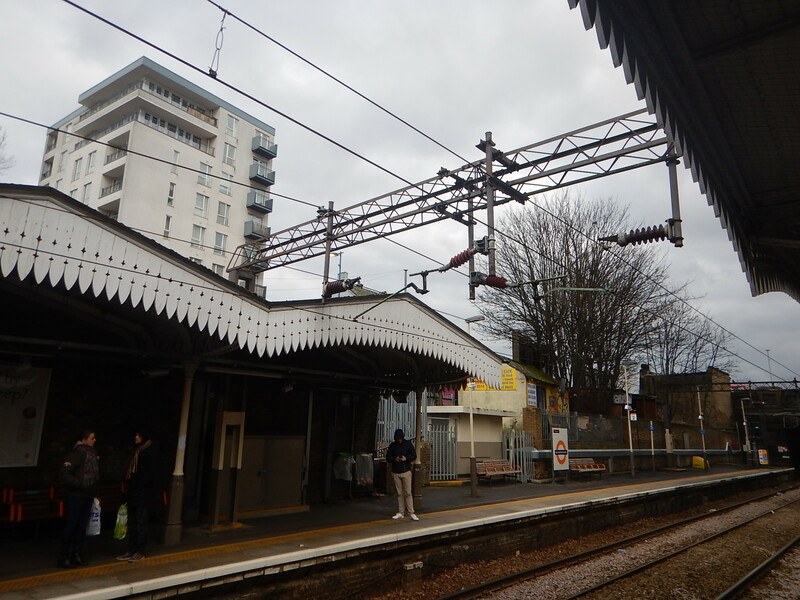 This picture shows 25 KVAC electrification at Walthamstow Central station. Note the extra insulators to deal with the higher voltage. Would it be possible and worthwhile to convert all of the Metro lines to 25 KVAC? In theory this must be possible, but I think it is probably more important to first beef up the electrification gantries to the higher standard of the South Hylton Branch. A driver told me, that electrification failures are not unknown. Trains running on 25 KVAC are more energy-efficient. Trains could be built that would be able to run on both 1500 VDC and 25 KVAC, that use the same pantograph for current collection and automatically adjust to the voltage received. Trains with batteries can be used on sections without electrification. Mixed voltage systems are possible, that would have 25 KVAC electrification on some sections of track and 1500 VDC on others. The passenger Health and Safety case would need to be established for the higher voltage. The electrification could be designed holistically with any future trains to maximise reliability, electrical efficiency and operational flexibility, and minimise costs. Obviously, during the changeover to new trains, all lines would need to be at 1500 VDC, so that the current rolling stock could be used as required. These pictures show a selection of Metro stations. The stations appear to be in generally good condition and vary from the the basic to well-preserved Victorian stations like Tynemouth and Whitley Bay. The platforms are generally of an adequate length, which except for some stations in tunnels seem to have been built to accept three of the current trains working together, which would be a formation 83.4 metres long. This would be long enough to accept one of any number of four-car trains running on the UK rail network, which are usually eighty metres long. London Overground’s, new Class 710 trains will be this length. Sunderland station, is an important station on the Metro. I describe the station and its operation in The Rather Ordinary Sunderland Station. Stations are step-free, but this is often by the use of ramps and a few more lifts woulds be welcome. Access from platform to train is generally good, as these pictures show. Note the picture of the access to a Grand Central Class 180 train. I suspect that when Northern replace their Class 142 trains, with brand new Class 195 trains on the services between Middlesbrough and Newcastle, that the step-free access will be good. I think a lot of credit is due to the original designers of the Metro, who thought about what they were doing and seem to have created a system that fitted heavy rail trains, Metro trains and users requiring step-free access. Merseyrail’s Class 507 and Class 508 trains. The Class 315 trains of TfL Rail and the London Overground. The Piccadilly Line’s 1973 Stock trains. South Western Railway’s Class 455 trains. The trains of the Tyne and Wear Metro. |These pictures show the trains for the Metro. The quality is not bad for nearly forty years of service. The lady in the last picture, sitting in the front of the train, watching the world go by. Standing is not difficult in the rush hour for this seventy-year-old stroke survivor. The Metro needs a new train wash.
Wikipedia says this about the Proposed New Fleet. The proposed new fleet would consist of 84 trains to replace the existing 90 train fleet, as Nexus believe that the improved reliability of the newer trains would allow them to operate the same service levels with fewer trains. These are proposed to have longitudinal seating instead of the 2+2 bench seating arrangement of the present fleet, and a full width drivers cab instead of the small driving booth of the existing trains. The proposed new fleet is planned to have dual voltage capability, able to operate on the Metro’s existing 1.5 kV DC electrification system and also the 25 kV AC used on the national rail network, to allow greater flexibility. Battery technology is also being considered. I’ll put my ideas at the end of this note. The Metro is unique in the UK, in that it uses the Karlsruhe model to mix Metro trains with heavy rail trains on the Southern branch to Sunderland and South Hylton. If in the future modern signalling and trains are used on the Metro, an increasingly intricate set of routes could be designed. Add in dual-voltage trains able to run on both the Metro’s 1500 VDC and the National network’s 25 KVAC and the possibilities will be even greater. The trains are run in the same way as London Underground, with only a driver on the train, who does the driving and controls the doors. As I always find outside London, ticketing is still in the Victorian era. Will the Tyne and Wear Metro embrace a contactless card based on bank and credit cards? Wikipedia gives a list of possible extensions under Proposed Extensions And Suggested Improvements. Tyne Dock to East Boldon along a dismantled railway alignment through Whiteleas could easily be added, because two Metro lines are separated by only a short distance (1.61 miles). This would provide a service from South Shields to Sunderland via the Whiteleas area of South Shields. If ever there was a route for a battery-powered train, this must be it. The route is less than two miles. The route connects two electrified lines. You can see the disused track-bed on a Google Map. No electrification would be required. The battery would be charged between South Shields and Tyne Dock and East Boldon and Sunderland. Modern signalling would allow the route to be built as a single track if required, handling up to ten tph in both directions. Single platform stations could be built as required. I can certainly understand, why Wikipedia mentioned battery trains. Washington either via the disused Leamside line or a new route. Present planning may lead to the Leamside line being opened at least as far as Washington as a conventional rail line for passengers as well as freight, although this could be shared with Metro trains in the same way as the line from Pelaw Junction to Sunderland. Washington station would only be a short run of less than ten miles along a reopened Leamside Line. If somebody else paid for 25 KVAC electrification of the Leamside Line, then dual-voltage trains could run the service. If not, they could use battery-power. Either way, Washington would get a Metro service. If as I believe, the new trains on the Metro will be main line trains, then what is the point of running heavy rail services to the town, as the Metro would be able to serve more places and with a change at Newcastle station, you could get a train virtually anywhere. The possibility must also exist if the Leamside Line is developed as a diversion of the East Coast Main Line, then the Metro could go as far South as Durham. Blyth and Ashington, running on existing little-used freight lines. Northumberland Park station has been built to provide a link to a potential new rail service to these communities; if opened, it will not be a part of the Metro system. Ashington is around fourteen miles from Northumberland Park station, which means that an return journey might be possible on battery-power. In an article in the October 2017 Edition of Modern Railways, which is entitled Celling England By The Pound, Ian Walmsley says this in relation to trains running on the Uckfield Branch, which probably has a terrain not much different to the lines to Blyth and Ashington. If the Metro trains could have a high energy efficiency, I think it would be reasonable to assume that 4 kWh per vehicle mile is attainable. So a three car train, would need a battery of 14 x 2 x 3 x 4 = 336 kWh. That is not an unattainable figure for battery size. A northward extension to Killingworth and Cramlington has been planned since the Metro was on the drawing board, but would require widening of the busy East Coast Main Line to four tracks, which would be expensive, and a new alignment involving street running. Suppose the new Metro trains were modern trains, such as the latest offerings from Bombardier, CAF, Hitachi, Siemens, Stadler and others, that were able to do the following in addition to running on the Metro. Operate at around or even over 100 mph. Execute fast stops at a station. Would they be able to perhaps run a four tph Metro service along the East Coast Main Line to Cramlington station? I suspect with modern signalling and a couple of passing loops on the East Coast Main Line, the answer is yes! This may eliminate the need for street-running. Extending the Metro to the West End of Newcastle would require new track, involving tunnelling and bridging in rough terrain; this would be very costly and is perhaps least likely to receive funding, though would probably have the highest potential ridership. In this article in the Newcastle Chronicle, which is entitled What Could Happen To The Metro, this is said. A rail extension out of Central Station along the original Newcastle to Carlisle line could head along Scotswood Road to serve Newcastle’s west, while a bridge could then connect the city to the Metrocentre. This would be integrated with the Metro system. Building developments in Gallowgate have greatly reduced any chance of extending the Metro west from St James’ Park. The railway alignment still seems to be there in places. It would be another extension that would use battery-powered trains on sections, that don’t have electrification. Ryhope and Seaham, a proposal drawn up by Tyne and Wear Passenger Authority to use the existing Durham coast line south of Sunderland. Sunderland to Seaham is about six miles, so is definitely in range of battery trains. But that is being timid! Sunderland to Middlesbrough is probably about thirty miles and I believe it will be possible to do those sort of distances on battery power alone, in a few years. Provided that the train could be recharged at Middlesbrough. What would a four or six tph service between Middlesbrough and Newcastle Airport via Hartlepool, Seaham, Sunderland, Gateshead and Newcastle, do for the area? In this section on expanding the Metro network, it has surprised me how many of the extensions could be done with dual-voltage or battery-powered trains. I think it shows how we must be careful not to underestimate tyhe power of battery trains. But then I’m one of the few people in the UK, outside of the residents of Harwich, who’s ridden a battery-powered four-car heavy rail train in normal service! Mickey Mouse, they are not! I’ll repeat what Wikipedia says this about the Proposed New Fleet. I’ll now give my views on various topics. Heavy Rail Train Or Lightweight Metro? Will the trains be lightweight metro trains or variants of heavy rail trains like Aventras, Desiro Cities or A-trains to name just three of several? The advantages of the heavy rail train are. It could run at 90 or even 100 mph on an electrified main line. It will meet crashworthiness standards for a main line. It would likely be a design with a lot in common with other UK train fleets. It could run into most railway stations. If it was shorter than about sixty metres it could use all current Metro stations without station rebuilding. On the other hand the lightweight metro train would be lighter in weight and possibly more energy-efficient. Wikipedia says this about the seating layout. These are proposed to have longitudinal seating instead of the 2+2 bench seating arrangement of the present fleet. Longitudinal seating has been successfully used on London Overground’s Class 378 trains. This layout increases capacity at busy times. It allows passengers to distribute themselves along the train and get to the right position for a quick exit. But the biggest advantage, is that when linked to selective door opening, it enables a longer train to be used successfully in stations with short platforms. London Overground use this facility on their Class 378 trains to overcome platform length problems at a few stations on the East London Line. But train design is evolving. Bombardier have shown with the Class 345 train, that you can have both in the same train. So in a three-car train, you might have two identical driver cars with longitudinal seating and a middle car with 2+2 bench seating. Bombardier are able to get away with this, as they are maximising the space inside the train. I wrote about it in Big On The Inside And The Same Size On The Outside. These pictures show the inside of one of Crossrail’s Class 345 trains. Whoever builds the new Metro trains, they’ll probably have similar interiors. A trend seems to be emerging, where new fleets of trains are the same length as the ones they replace, although they may have more carriages. This has happened on Greater Anglia, Merseyrail and West Midlands Trains. It probably makes sense, as it avoids expensive and disrupting platform lengthening. Currently, the Metro trains work in pairs, which means a train length of 55.6 metres. As the standard UK train carriage size for suburban multiple units is often twenty metres, then if the platforms can accept them, three-car trains would be possible for the new trains. Longer trains would be possible in most stations, except for some in the central tunnel, which appear to have platforms around sixty to seventy metres long. So perhaps four-car trains would be possible for the new trains, that would use selective door opening at the short platforms of the stations in the central tunnels. Because the trains are walk-through, passengers can position themselves accordingly, for the station, where they will leave the train. London Overground have also shown that selective door opening and walk-through trains can be used to advantage, when trains are lengthened to increase capacity. Obviously, the trains will have the capability of running on both 1500 VDC and 25 KVAC overhead wires, as the extension to Killingworth And Cramlington would need the latter, for a start. German cousins of the Class 399 tram-train. A ceramic rod separates the two voltages and the pantograph just rides over. The train or tram-train, then determines the voltage and configures the electrical systems accordingly. These would appear to be key to several of the proposed extensions. Batteries also enable other features. Movement in depots and sidings without electrification. Emergency power, when the main power fails. In a few years time, all trains with electric drive will have batteries, that are probably around 75-100 kWh. To work efficiently on the East Coast Main Line, 90 mph or even a 100 mph operating speed will be needed. Note that Crossrail’s Class 345 trains, which will generally work routes very similar to the Metro, have a 90 mph operating speed. These faster trains will result in an increased service. Currently, trains between Newcastle Airport and South Hylton take 65 minutes with sixteen stops. Modern trains have the following features. Minimised dwell times at stations. Smooth regenerative braking and fast acceleration. Driver Advisory Systems to improve train efficiency. Higher safe speeds in selected sections. Trains are designed for quick turnrounds at each end of the route. In addition, train operators are organising station staff to minimise train delays. Put it all together and I’m pretty certain, that this route could be done comfortably in under an hour. So the same number of trains are able to do more trips in every hour. Under Electrics, Wikipedia says this about the ability of the trains to handle tight curves. Metro has a maximum speed of 80 km/h (50 mph), which it attains on rural stretches of line. The vehicles have a minimum curve radius of 50 m (55 yd), although there are no curves this tight except for the non-passenger chord between Manors and West Jesmond. Could this chord be avoided by different operating procedures? Northern’s services from Newcastle station are. 1 tph – Northbound on the East Coast Main Line to Cramlington and Morpeth with services extended to Chathill at peak hours. 1 tph – Southbound along the Durham Coast Line to Middlesbrough calling at Heworth, Sunderland, Seaham, Hartlepool, Seaton Carew, Billingham, Stockton andThornaby, with an extension to James Cook University Hospital and Nunthorpe. 1 tph – Westbound on the Tyne Valley Line to Carlisle calling at MetroCentre, Prudhoe, Hexham, Haydon Bridge, Haltwhistle, Brampton and others at alternate hours. Westbound slow service on the Tyne Valley Line to Hexham calling at Dunston, MetroCentre, Blaydon, Wylam, Prudhoe, Stocksfield, Riding Mill, Corbridge and terminating at Hexham, with an extension to Carlisle at peak hours. 1 tph – Newcastle to Metro Centre calling at Dunston only during the day. Pathetic is probably a suitable word. When Greater Anglia have their new trains, services between Ipswich, Norwich, Colchester, Bury St. Edmunds, Lowestoft and Yarmouth, will be at least two tph and sometimes three and four on most routes. Newcastle, Sunderland and Middlesbrough surely need a four tph rail connection along the Durham Coast Line. I believe that dual-voltage Metro trains with a battery capability could run between Middlesbrough and Newcastle at a frequency of four tph. If they can’t, I’m certain that a suitable train could be procured. If the new Metro trains are correctly-configured heavy-rail trains, then surely a go-anywhere express version can be built. An interior geared to the needs of passengers. Four or five cars with selective door opening. Ability to run on Metro tracks using 1500 VDC overhead wires. Ability to run on 25 KVAC overhead wires. Batteries for regenerative braking, emergency power and distances up to two miles. Diesel or preferably hydrogen power pack. Sufficient range to keep going all day. As the trains would have an identical cross-section to the new Metro trains, they could do any of the following at Newcastle. Go through Newcastle station to Metrocentre, Hexham, Carlisle, Morpeth or some other destination. Go through the tunnel of the Metro to Newcsastle Airport. Go through the tunnel of the Northumberland Park station to link to the North-East. I believe that such a train could run as an express to link the whole conurbation from Middlesbrough to Morpeth together. The train that i just proposed would be ideal for this route. I also believe that Metrocentre needs at least six tph connecting it to the centre of Newcastle and the Metro. The proposed West End of Newcastle branch of the Metro looks to be a necessity, to provide some of this frequency. What Is The Point Of Northern? With the right trains, all of the local services in the Tyne-Wear-Tees area can be satisfied by a Metro running modern trains making the maximum use of modern technology. This model already works in Merseyside, so why not in the North-East? And Manchester, Leeds and South Yorkshire! I have always been keen on the creation of a Tees Valley Metro. I wrote about it in The Creation Of The Tees Valley Metro. Get the design of the trains on the Tyne and Wear Metro right and they could work any proposed Tees Valley Metro. I think that Nexus will get some very interesting proposals for their new trains, which will open up a lot of possibilities to extend the network. Transport for London and Nexus (The Tyne And Wear Passenger Transport Executive) are both asking for bids for new trains on the Docklands Light Railway and the Tyne and Wear Metro respectively. Both systems are standard gauge light railways, but how do they compare to each other and to other trains running or soon to run in the UK? This table shows the width and height of various trains, that are currently in use on the UK network. What surprised me was how similar the width and height of these vehicles are. 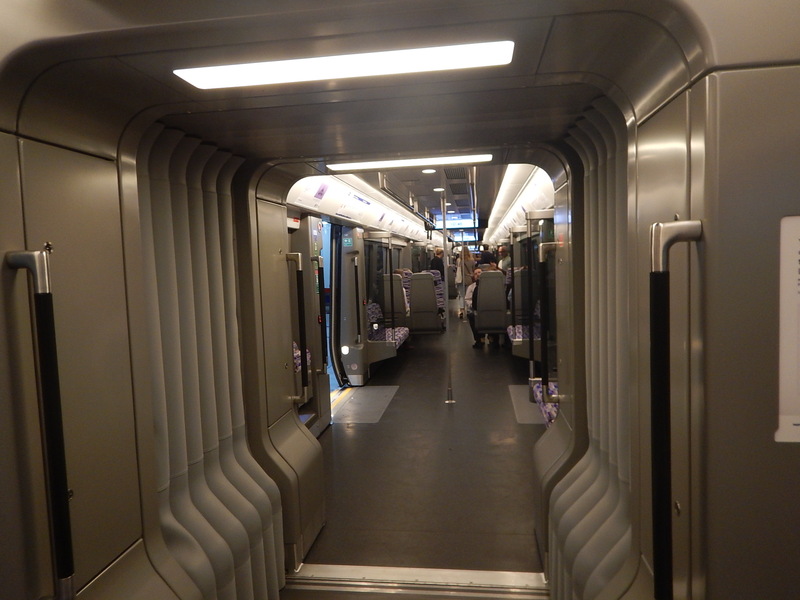 The Class 345 train uses clever design to make the train as wide as possible inside. Wikipedia says this about how Bombardier Electrostars were designed and built. The Clubman/Turbostar/Electrostar platform is a modular design, which share the same basic design, bodyshell and core structure, and is optimised for speedy manufacture and easy maintenance. It consists of an underframe, which is created by seam-welding a number of aluminium alloy extrusions, upon which bodyside panels are mounted followed by a single piece roof, again made from extruded sections. The car ends (cabs) are made from glass-reinforced plastic and steel, and are huck-bolted onto the main car bodies. Underframe components are collected in ‘rafts’, which are bolted into slots on the underframe extrusion. The mostly aluminium alloy body gives light weight to help acceleration and energy efficiency. From what I’ve seen in the media about the manufacture of Bombardier’s new Aventra, the manufacturing methods are similar but improved. I would suspect that most modern trains are made in a similar way, with extensive use of lightweight aluminium extrusions for sides and roof. Bombardier’s method of making the cabs of glass-reinforced plastic and steel, must also give the flexibility required to create an appropriate cab for different classes of trains. Currently, there are Aventras on other, that feature cabs without and with a gangway. I suspect that Bombardier’s design team for the Aventra made sure that the design of the body could be adapted to produce a replacement train for the Tyne and Wear Metro or the Docklands Light Railway. After all, they built most of the current cars for the DLR! This all leads me to the conclusion, that production of the bodies for the new vehicles for both routes will not be a problem. And not just for Bombardier! Stadler seem to have downsized a Flirt for Merseyrail. Using an existing design, must also mean that equipment like seats, air-conditioning, doors and other fitments, just have to resized if needed. Bombardier have shown with the Aventra, that they can make cars in different lengths for different versions of the train. The Class 710 trains for the London Overground are being built as twenty metre long trains, whereas other variants have longer cars. All Aventras ordered so far, appear to be walk-through between articulated cars. The picture shows the inside of one of Crossrail’s Class 345 trains. So what can we ascertain about the design the new fleets for the Docklands Light Railway and the Tyne and Wear Metro? Under Future Stock in the Wikipedia entry for the Docklands Light Railway Rolling Stock, this is said. TfL is seeking to order 43, 87-metre-long (285 ft) trains, 33 of which will replace the 70 B90/92 trains currently in use, which are the oldest on the DLR. The remaining 10 would support capacity increases in the Royal Docks area. DLR services presently operate with two or three trains coupled together, but the new fleet will be fixed formation units with walk-through carriages equivalent to the length of three current trains. The aim is to issue an invitation to tender for the new fleet later this year, with contract award planned for summer 2018. The trains will be walk-through. The new train length quoted of 87 metres, doesn’t fit the length of three current trains, but it is close to the length of three current cars, so I suspect that is what is meant. In the early 2010s, the whole Docklands Light Railway was upgraded for three-car trains. The trains need the ability to handle tight curves. It does appear that Bombardier and the other manufacturers could design a train for the Docklands Light Railway by adapting their current design. To handle the tight curves, it would probably be a walk-through train with several articulated sections. The current trains running as a three-car unit are 84 metres long. Each of the current cars is 28 metres long. Each of the current cars is articulated in the middle. Thus a three-car train has six sections. The current cars have four double doors on either side. Thus a three-car train has twelve doors. The new trains will be 87 metres long. It should be noted that Edinburgh has a similar problem of tight curves and gradients like the Docklands Light Railway. 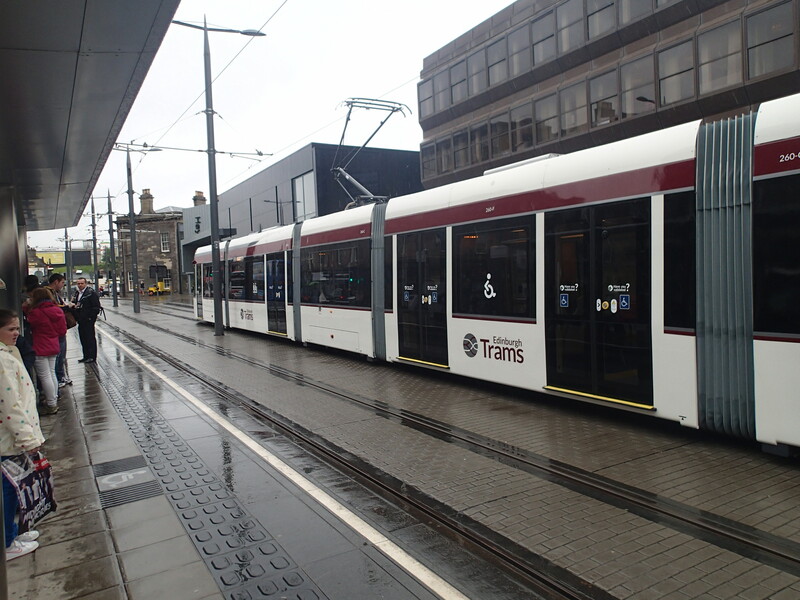 The city’s Urbos 3 trams are just forty metres long, but have seven articulated sections, with six doors on either side. Note the short sections, which show what is possible in an articulated rail vehicle. As the current trains have six sections, this would be a starting point for a new design. Four or five sections would be a more affordable design. There will be an optimum number of sections to handle the curves and gradients. Does an articulated walk-through design need quite as many doors as current trains? It looks like a good cost-effective design is possible. In my view longitudinal seating needs a walk-though capability. Could they be adapted from proven lightweight main line rolling stock, by perhaps giving the trains a smaller cross-section? They would only have two instead of four cabs. They could be articulated, walk-through trains. Class 399 tram-trains have shown dual voltage through one pantograph is possible. Using a certified main line train, that had been made smaller would surely mean that certification would be easier. I believe, that a section of the Tyne and Wear Metro works using tram-train principles under the Karlsruhe model, which allows the current trains to share tracks with other rail services. So the new trains would make it possible for the Metro to be expanded onto main line railways. If they were electrified using 25 KVAC. Freight lines, which might see a reopened passenger service, could be electrified using the current Metro 1,500 VDC system. It strikes me thyat by getting the design of the rolling stock right, a lot of possibilities could open up for the Tyne and Wear Metro. This article in the underland Echo is entitled Metro bosses unveil plans to extend network, including direct link between Sunderland and South Tyneside. This is the opening couple of paragraphs. Ambitious plans to extend and expand the region’s rail and Metro networks have been drawn up by public transport bosses. The scheme – to be presented to the North East Combined Authority (NECA) – could see a direct link between Sunderland and South Tyneside and the network extended as far as Washington and Peterlee. It is a comprehensive plan, that takes note and advantage of the best practice and technology from around the world. Plans for the Tyne and Wear Metro include. Sunderland City Centre to Doxford Park using the route of the former Hetton Colliery Railway. New Routes From South Tyneside by linking the South Shields and Sunderland routes, using an existing single-track railway in the region of Tyne Dock. A Wearside Loop can be created to serve Washington using existing rail routes. The Leamside Line could be used as a new Metro route. Re-electrification of Sunderland to 25 KVAC would give advantages to Network Rail and allow Metro services to go South. Dualling of the track through South Tyneside. Every plan seems to have serious element of using former and existing routes in a creative manner. This map shows how the network could look in a few years. What many forget about the Metro, is that it some of its operation on the Sunderland route is based on a modified form of the Karlsruhe model, where heavy rail passenger and freight trains, share tracks with the Metro. I was surprised once on a station on the Metro to see a Grand Central High Speed Train come through. The last two improvements listed above; 5 and 6, use this capability. The Durham Coast Line runs from Newcastle to Middlesborough and the East Coast Main Line, via Sunderland and Hartlepool. The only electrified section of this line is that which is used by Metro trains. If new Metro trains could run on their current 1500 VDC and 25 KVAC, then if the line was fully electrified, the following benefits, would be realised. Metro trains could go as far South as Middlesbrough. Grand Central could run electric trains to Middlesbrough, Hartlepool and Sunderland. There would be a second electrified route South from Newcastle, for use as a diversion. 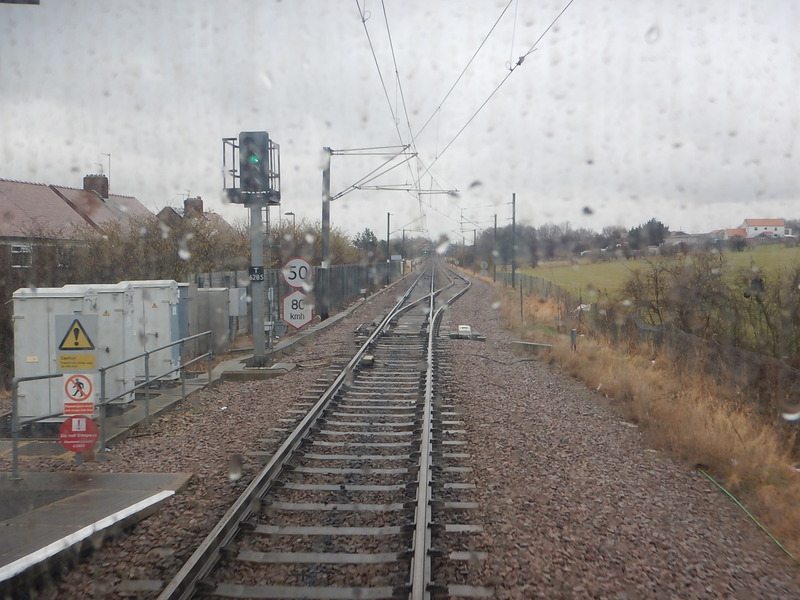 Network Rail would get maintenance advantages, as the electrification is network standard. So we would see Metro trains sharing the route with high speed passenger trains like Class 800s and electrified freight. The South Tyneside Dualling would incorporate the freight line to the Jarrow Oil Terminal into the Metro. I think that the line would be arranged, so that if freight ever needed to use the line, the Karlsruhe model would apply. It looks to me that this dualling and the upgraded electrification through Sunderland would be done together. New trains are also mentioned and in this article on Global Rail News. This is said. Nexus, the Tyne and Wear region’s Passenger Transport Executive (PTE), said it would look to procure a new fleet of multi-system trains capable of operating on the Metro’s 1.5 kV DC electrification system and the 25 kV AC used on the national rail network. Battery technology is also being considered for short sections of non-electrified line. Looking at the map, there are a couple of short new lines, that might be ideal for IPEMUs. Taken as a whole, it is good well-thought out plan.